As travelers hit the road this summer, they are likely to come across a number of construction projects – and workers – along the way. And while highway investments are estimated to create thousands of jobs each year, especially during the busy summer construction season, these positions only represent 15 percent of the 14.5 million infrastructure jobs found nationally. 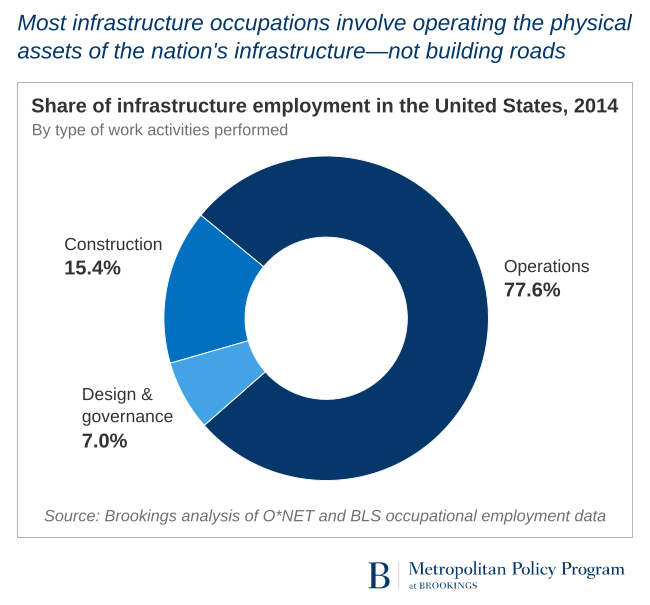 Instead, more than 77 percent of all infrastructure workers tend to focus on operating different physical assets over the course of many years, while an additional 7 percent are involved in infrastructure design and governance. So while you may see highway maintenance workers and pile-driver operators carrying out short-term construction and repair, it’s actually the bus drivers and cargo agents that benefit the most from this work in the long run. The fact that they often earn more competitive wages compared to all other workers nationally – without having to overcome significant education barriers – also speaks to the importance of these various infrastructure occupations to expanding economic opportunity. This will be especially true as up to 3 million infrastructure workers retire or otherwise permanently leave their jobs over the next decade, leaving an enormous gap to fill in the labor market.